A silk blouse is a wonderful addition to any wardrobe and can last for a long time with the proper care. 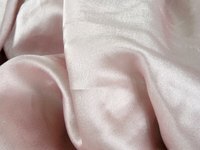 Silk is a delicate fabric that requires special treatment. Although the fibers are strong, the strength of the fabric often depends on the weave of the blouse. Silk is also easily weakened by deodorant, perspiration and sunlight. It is important to take extra care when cleaning silk blouses in order to remove unsightly sweat stains. Use a damp sponge to dab the sweat stain with a few drops of diluted ammonia. Use light strokes in order to prevent any damage to the silk blouse. Gently hand wash the silk blouse separately with lukewarm water and non-alkaline soap. A strong alkaline soap will weaken the silk fabric and cause damage to the silk blouse. Rinse the soap thoroughly from the silk blouse. Make sure to handle the silk blouse carefully when rinsing it. Do not wring or twist the silk blouse to remove excess water; silk is much weaker when it is wet. Gently roll the silk blouse in a bath towel in order to remove excess moisture. Air dry the silk blouse in a dark area away from sunlight. Sunlight can weaken and damage the silk blouse. Do not soak silk for more than a few minutes. Do not use harsh detergents when washing silk. Do not use bleach on silk because it will ruin the fabric. Texere Silk: "Cleaning and Washing Silk"